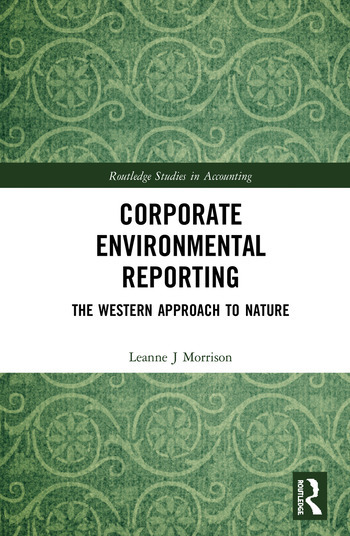 This book explores corporate environmental discourse by examining a sample of corporate environmental reports through the lens of environmental philosophy. Findings include the predominant use of a dualistic approach towards nature, which highlights the perceived ‘separateness’ of companies from the natural world. Also explored are the corporate articulations of interconnectivity and transcendence, two philosophical approaches that are also in common use in western culture. The expression of these themes reveals the discursive underpinnings of a harmful relationship with nature. Exploring the ways in which discourse informs corporate relationships with nature allows for an in depth ‘diagnosis’ of current environmental problems. Dr Leanne J Morrison is a lecturer at the RMIT School of Accounting, Melbourne, Australia.